What Equipment Does Your Retail Store Need? Do you know which equipment your retail store needs? Starting a business, or buying an existing business from someone, is a very exciting position to be in. However, if you run out of the necessary supplies, you will face the consequences. If you're lucky, you might just experience a slight inconvenience if you're short on supplies. However, if you're unlucky and run out of the necessary equipment, it could spell disaster for your business. The best way to keep your business running smoothly, and to keep disaster at bay, is to make sure you have the supplies you need before you run out of them. Of course, which supplies you need depends entirely on the kind of retail store you operate. But, to give you a good idea of the kinds of equipment a retail business needs, here's a list of the supplies you'll need for the opening day. Most retail store stock rooms need the same basic equipment. This includes trash cans, trash bags, a pricing gun, a tagging gun, and a labeler. You'll also likely need signage supplies, box cutters, a tape gun, brooms, mops and other cleaning supplies, such as disinfectant. Also, you want to avoid litigation so don't forget the wet floor signs. Having a customer trip and fall on a wet floor is a lawsuit waiting to happen. The supplies you need for your break room are pretty much based on common sense. Make sure you have a coffee pot, coffee and filters, a refrigerator (either a full-size fridge or a mini-fridge), a microwave oven, storage lockers, and trash cans. You'll also need tables and chairs, a television, kitchen cleaning supplies and posters informing employees of their rights, code of conduct and employee responsibilities for cleaning the break room. You'll need all the basics, such as a filing cabinet, a safe, computer, printer, scanner and shredder. While increasingly becoming obsolete, some businesses still use fax machines. Your office should also have landline telephones with a professional voicemail system and basic office supplies such as pens, paper, staplers and staples and paper clips. 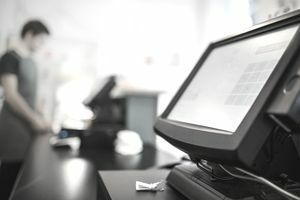 A well-equipped sales floor has cash registers, shopping bags of various sizes, shopping carts and baskets, an "open" and "closed" sign, security mirrors and a security system. Your sales floor will also need shelving, racks, POP displays, hangers, a TV and stereo system, and, finally, your inventory. If you're not exactly sure what kind of equipment you'll need, or you simply want to make sure you have everything covered before your grand opening, contact an organization designed to help business owners. Try your local Chamber of Commerce or your local branch of the Small Business Association for guidance. Either might be able to help you or, at the very least, guide you in the right direction. If you still have concerns or questions, budget allowing, consider hiring a consultant on an hourly basis. An experienced professional will be able to provide tips and address all your concerns.